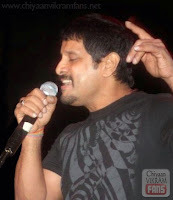 Home » Latest Buzz » Chiyaan Vikram turns Singer Again! Chiyaan Vikram turns Singer Again! We all know Vikram’s penchant for singing. In the past, the actor enthralled his fans by crooning for films like ‘Gemini’ and ‘Kanthaswamy’. And now, he has turned a singer again, this time for his forthcoming movie directed by Vijay. The song name ‘Paappa…. Paappa’, composed by G V Prakash Kumar, was recorded recently. “Vikram has good music knowledge and the song has come up well. It will sure become a chartbuster,” says the music composer. Interestingly, Sainthavi, to whom Prakash will tie the knot soon, has also sung a number in the same film. “The song “Vizhigalil oru vaanavil” too has all the qualities to top the charts,” Prakash says with a smile. hai chiyaan all the best..to u u.......!!! !